Choosing flooring is rarely easy. When it comes to your living room, kitchen or bedroom you likely have at least an idea in mind. Or you have furnishings to help guide you to a certain style or color of flooring. What guides you for your entryway? Kermans flooring store has a few tips to consider for this first impression to your home. It may sound boring but you'll thank us later. Don't put a light colored carpet just inside your front door. All the foot traffic and outdoor elements brought inside will quickly stain the carpet and create wear patterns you just can't avoid. When you're looking for floors for your foyer, you're better off with hard surface flooring. It's easy to clean and handles the elements better than carpets. There are many hard surface floors to choose from and each has some benefits for your entryway. The choice at this point can be driven more by your personal preference than by any practical considerations. The warmth of a hardwood floor is a beautiful way to greet guests to your home. It can also create nice continuity into the house if you're already using hardwood on the stairs and or rooms at the front of the house. They key to selecting a hardwood floor for this busy area is durability. Choose a hard wood such as oak, hickory or maple to handle the traffic. You might also consider a textured or wirebrushed style to stand up to the inevitable dents and scratches. Key consideration: Puddles on rainy or snowy days can cause damage to a hardwood floor. Invest in a good indoor entry mat and boot tray to help keep water off the floor. Learn more about solid hardwood. Certamic tile can certainly stand up to the high traffic and outdoor elements that are a natural part of any entryway. There's no concern about water issues with tile, just mop up any messes. Many homeowners are pleasantly surprised at the versatility of ceramic floors today. You have far more choices than a standard 12x12 white square with ceramic tile. Key consideration: Ceramic tile can be slippery. Invest in a good absorbent entry mat to help keep the water from causing a slick spot. Learn more about ceramic tile. 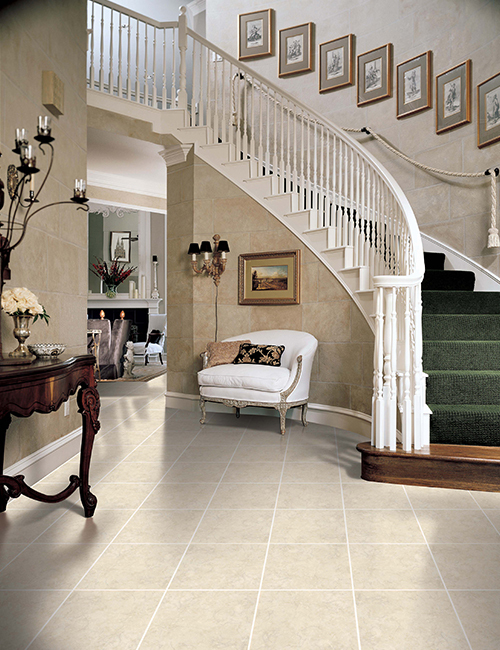 Luxury vinyl tile might just be the perfect entryway floor choice. Thanks to advanced manufacturing technology, these vinyl tiles replicate the look and textures of many other floors such as ceramic tile, slate, marble, and hardwood. Luxury vinyl tile also has a specially constructed wear layer to protect the floor from scratches, scuffs, dents, moister and stains. It's easy to maintain, comfortable underfoot and less expensive than the floors it mimics. Key consideration: There really aren't any concerns when it comes to luxury vinyl tile. It has everything you need to stand up to the high demands of an entryway while also creating a beautiful impression for your guests. Learn more about luxury vinyl tile. There are other choices beyond these three - laminate wood, slate tiles, marble, porcelain tile and more. All choices have their pros and cons but all are great options for your entryway. Learn more about the benefits of hard surface flooring in our free brochure and then stop by our showroom to pick out the perfect floor for your foyer.